Applications: Use on an angle grinder (preferably variable speed), or metal polishing machine, such as Finipower to pre-polish stainless and other steels. Use after sanding down and de-burring to save huge amounts of time in polishing - these discs achieve an excellent pre-polished finish quickly. Highly effective on stainless steel, but can also offer significant time saving when polishing other metals. The FAG grade 4 has a very open structure and is ideal for stripping coatings off metal surfaces, such as aluminium, with minimal surface damage. The SAG grades are in a denser material and are excellent metal polishing products, significantly cutting the time taken with more traditional methods. MAG discs have more aggression and will leave swirl patterns on the surface. TAG can be considered for light grinding, eg for TIG weld removal. Product Notes: Made from non-woven abrasive, processed and bonded into 'unitised' material from which the discs are pressed. Choose grade SAG-5 for most polishing jobs for the best pre-polished finish, or grade SAG-7 for more aggression and a sheen finish. Mounted on fibreglass for directly fitting to the machine - no backing pad required. Also Available: To go to an even higher finish, we stock felt discs for use on the polisher, as well as the metal finishing polishes to achieve up to a mirror finish. 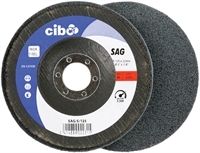 These SAG finishing discs use 'unitised' material made from non-woven abrasive base, reprocessed and bonded, then pressed into discs. They provide a solution to achieving a high sheen on metal, working especially well on stainless steel. To polish a metal surface using only an angle grinder, firstly sand the surface to remove coating and scratches. The sanding disc selection will depend on the type of surface; for example, you may wish to use grip 'Velcro type' backed sanding discs on a flat surface. From say, a 220 grade finish, use the SAG disc to polish to a high sheen. You could give a final polish with a polishing compound on a felt disc or polishing wheel. The SAG disc will minimise the polishing work significantly. Ideally a variable speed machine should be used as a better polished finish is achieved with lower speeds.